MOSCOW, March 18. /TASS/. The presidential election in Russia has wrapped up with the closing of the last polling station in Kaliningrad at 21:00 Moscow time. Only after the last polling station has shut its doors, can the exit polls or initial results be made public. 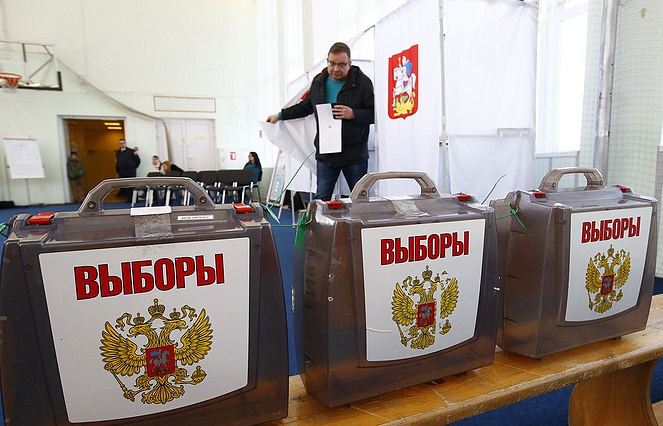 Given that Russia's territory stretches across 11 time zones, the elections kicked off in the Far East when it was Saturday night in Moscow and ended in Kaliningrad Sunday night when it was Monday morning in the Far East. The voting continues, however, for Russian citizens located in Europe and in the Western hemisphere. Voter turnout has come in at 59.93% as of 18:00 Moscow time, and this figure is not final, yet it is already higher than the respective turnout in 2012. According to Central Election Committee Deputy Head Nikolai Bulayev, the CEC has not received "any serious complaints" from any party or candidate. "If we discriminate between real and fake complaints to the Central Election Commission, I have seen just a few real ones," he noted. Eight candidates are running for the highest office in the Russian Federation. Among them are: incumbent President Vladimir Putin; Pavel Grudinin, director of the Lenin State Farm (nominated by the Communist Party of Russia); TV personality and socialite Ksenia Sobchak (nominated by Civil Initiative); Sergey Baburin, head of the Russian People’s Union party; Maxim Suraikin, chairman of the Central Committee of the Communists of Russia party; Boris Titov, chairman of the Party of Growth and Russian Presidential Envoy for Entrepreneurs’ Rights; Grigory Yavlinsky, head of the Yabloko Party’s federal political committee; Vladimir Zhirinovsky, leader of the Liberal-Democratic Party of Russia (LDPR).